Never Let Me Go, the anemic adaptation of Kazuo Ishiguro's famous book of the same name , puts all its money in a sort of fuzzy, idyllic, Cotswold-saturated nostalgia, and unfortunately it's a waste. Much like the protagonist who waits for people to break up or die, we waited… and waited… and waited for this movie to end. Ostensibly a dystopia, though we'll remain spoiler-free, the tale is set in recent-past England, and it's a typical look at lost love and wistful childhood memories that abound in other films about the English being bad at love: Atonement springs immediately to mind, with the same country manor setting for a love triangle that goes on for the characters' entire lives. Though another Ishiguro adaptation, Remains of the Day, is also very similar. Kathy (Izzy Meikle-Small as a child, the cute Carey Mulligan as an adult), Ruth (Ella Purnell as a child, Keira Knightley as an adult) and Tommy (Charlie Rowe as a child, Andrew Garfield as an adult) are students at your Standard English Boarding School - where they frolic in the fields, hide buttons in their little tin boxes, and play deadly amorous games with each other. This could be any other film about the posh and heartbroken, what with their inhibited half-confessions and epic yearning. They grow up, they pine. Some slightly sci-fi stuff happens, but the movie isn't too concerned about it - it's essentially just another way to drive the same point home. And in case you still had any doubts about what, indeed, the point of all this is, Kathy helpfully TELLS YOU THE MORAL OF THE STORY in the end. Thanks, K! Few films accurately capture the poignant, impermanent transcendence of an English countryside - our recently reviewed A Month in the Country is one of them. Few films know what to do with love too, it seems, and Never Let Me Go presents us with the same fairy tale we've been watching since Disney: pre-pubescent "true love" that lasts a lifetime, the virgin vs. whore (with the whore meeting her usual end), people who are static, unchanging and yearning, YEARNING, so painfully, ALL THE TIME. Which is not to say that statically yearning unreconstructed romantics aren't occasionally fun. But when their Truly Tragical Romanticness is driven home with a hammer by the director (here, Mark Romanek), we get bored and a little insulted. We get it! We can't help compare Romanek unfavorably to our recent worshipee, John Sayles: in John Sayles's Limbo, there is a stock "nightmare torment angst" scene when tragic fisherman Jumpin' Joe comes awake with a gasp, causing lounge singer Donna to awake and ask what's wrong. A shaken Joe comments only that you can't always save people. END SCENE. DONE. We got it! Great! 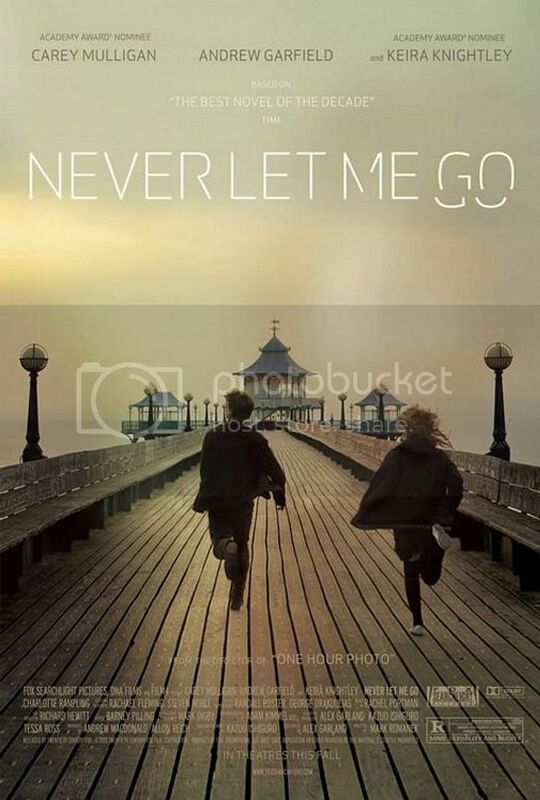 In Never Let Me Go, there is a stock "sensitive boy has tragical rage angst" scene, which is long, and detailed, and milked for all its juicy tragicalness. We get it! We get it already! THIS REVIEW WAS ABOUT THE MOVIE NEVER LET ME GO AND HOW WE DIDN'T LIKE IT VERY MUCH. BUT IT'S NOT REALLY A REVIEW ABOUT A MOVIE AT ALL; IT'S ABOUT LIFE. PERHAPS IF ONLY WE HAD VALUED THE PRECIOUS MOMENTS WE HAD ON THIS EARTH WE WOULD NEVER HAVE WATCHED IT/WE WOULD HAVE LIVED LIFE MORE COMPLETELY/LESS TRAGICALLY. SO MANY REGRETS! Thank you for this, I was really curious about this one since I liked the book a lot. I guess White Countess had to be the best Ishiguro on film so far.